Last night I linked to story about a new study showing that medical bills contributed to 62% of all personal bankruptcies in 2007. According to the authors, that’s up 50% from 2001, once you adjust the numbers to compare apples to apples. Megan McArdle is skeptical. Objection 1: could slowly but steadily rising healthcare costs really cause such a huge increase in the bankruptcy stats in just six years? It’s hard to say without more data, but it sounds plausible to me given the fact that bankruptcies are outliers to begin with. Objection 2: other studies have come to different conclusions. That’s addressed here. Objection 3: why do the subjects of the study themselves self-report at different levels? That’s also addressed here. [Elizabeth] Warren and her co-authors have obscured important and obvious facts that call the integrity of the work into serious question. ….What Warren et. al. 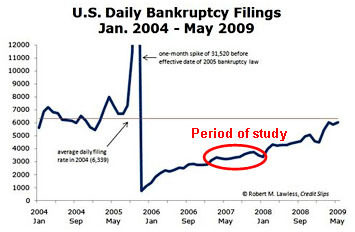 neglect to mention is that bankruptcies fell between 2001 and 2007. In fact, they were cut in half. Going by the numbers Warren et. al. provide, medical bankruptcies actually fell by almost 220,000 between 2001 and 2007, a fact that they not only fail to mention, but deliberately obscure. Are Warren, et. al. unaware that bankruptcies fell by half? No bankruptcy analyst could possibly be unaware of this fact; it has been the most talked-about phenomenon in the bankruptcy area since the 2005 law was passed. ….What’s left out here? That in 2001, 1.45 million households filed for bankruptcy. In 2007, that number was 727,167. Had their paper done the basic arithmetic, readers would easily have seen that their own numbers imply a decrease in medical bankruptcies, from about 750,000 to slightly over 500,000. Yet their paper does not merely ignore this fact; it uses language that seems deliberately designed to conceal it. I invite any of my readers to scan the paper for any hint that medical bankruptcies had fallen significantly over 6 years. For my money, this is an important point that should have been addressed directly in the study. At the same time, it’s not clear that it’s nearly as sinister as Megan suggests. If I move out the fences in every baseball stadium in the country, the fact that fewer home runs are hit at Dodger Stadium isn’t very interesting. What is interesting is whether the proportion of home runs per at-bat goes up or down at Dodger Stadium more than it does elsewhere. Likewise, the authors of the bankruptcy study faced a change in the law that affected all bankruptcies and made it impossible to compare raw numbers. The fences had been moved out, and a large number of people who once would have declared bankruptcy because of, say, a $20,000 medical bill, couldn’t do so anymore. Naturally the absolute number of medical bankruptcies went down, but that doesn’t really tell us much. It’s impossible to say anything with certainty since the change in the law was so sweeping, but other data in the study suggests that bankruptcies with a medical component are similar to the overall population of bankruptcies, both demographically and otherwise. They aren’t systematically either better or worse off than average. This in turn suggests that if you compare the better-off half and the worst-off half of all pre-2005 bankruptcy filers, their medical components probably matched pretty closely. Why do we care? Because bankruptcy filings after 2005, when the law made it harder to file, were probably similar to the worst-off half of the pre-2005 bankruptcy filings. This means the group in the 2007 study is probably similar to the worst-off half of the group in the 2001 study — which makes a direct comparison impossible. However, since the proportion of medical bankruptcies in that group likely mirrors the proportion in the entire pre-2005 population, it means that if the law hadn’t changed and the total population of bankruptcies had stayed large, the proportion of medical bankruptcies probably still would have increased. This is all very rough and tentative, and better data would be helpful. Still, even though I agree that this is something the authors should have addressed head on, they probably did about as well as they could with the hand they were dealt.